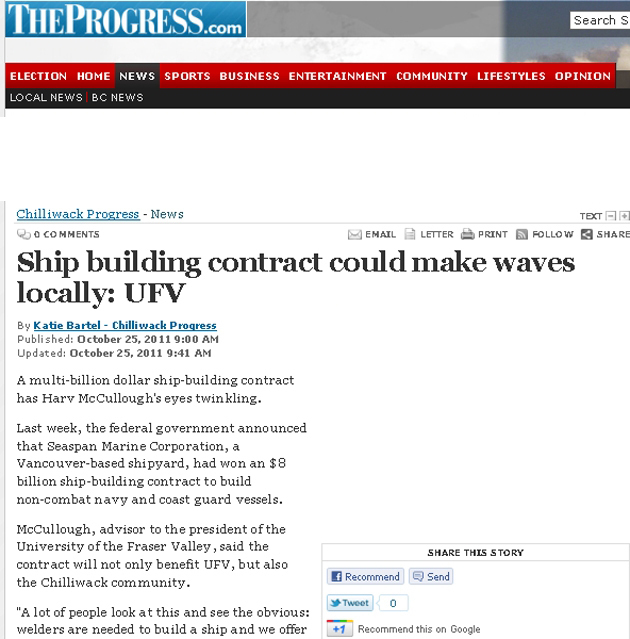 A multi-billion dollar ship-building contract has Harv McCullough’s eyes twinkling. Last week, the federal government announced that Seaspan Marine Corporation, a Vancouver-based shipyard, had won an $8 billion ship-building contract to build non-combat navy and coast guard vessels. 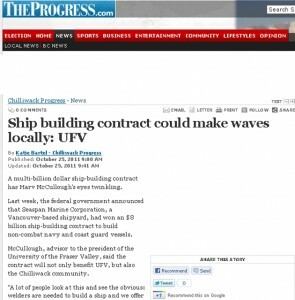 McCullough, advisor to the president of the University of the Fraser Valley, said the contract will not only benefit UFV, but also the Chilliwack community. Billions of dollars are being injected into the provincial economy, and with that come new jobs and opportunity. In a news release issued by Seaspan, the corporation expects 4,000 new jobs to be created over the next eight years as a result of the contract. “You have to look at the global picture as to how this spinoff is going to affect the entire province,” said McCullough. “It’s not just about trades and technology. The community now has an opportunity to become employed in a new area, in well-paid jobs… and smaller, local companies will be able to pick up sub contracts for piece work. So now they begin to grow thanks to one large contract. The challenge for UFV, however, is that while it offers a wealth of trades and technology courses suitable for this kind of work, the university is currently operating overcapacity. Its numbers cannot increase without additional funding. “We have to watch now for one-time funding opportunities to come long,” said McCullough. “We are poised to access any kind of special training funding that may come available.